Welcome to the future of TV news, embodied by WXIA’s renaissance man, Bill Liss. Liss has embraced the multitasking reality of TV news in the 21st century. Does Liss complain about having to produce stories for both TV and the web (and his daily business report each morning)? Hell, no. He just does it all at the same time. 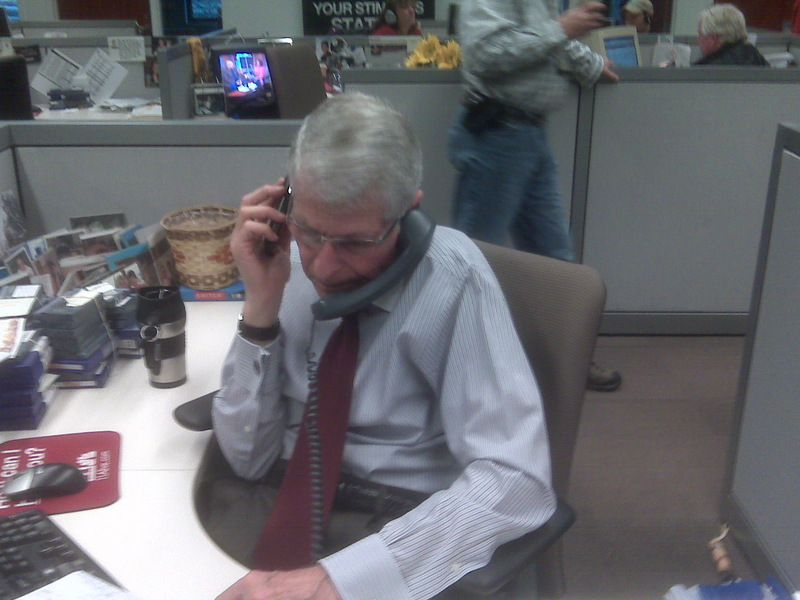 Gannett has given him two phones; Liss reasons that it makes sense to be time-efficient and use them simultaneously. Next, he’ll shoot and edit the story, upload it to the web, produce and anchor the newscast, then Windex the newsroom monitors. He won’t break a sweat either. The french cuffs, Louis Vuitton shades, and Brovelli necktie make this guy the best-dressed, multi-tasking news talent in the market. Not to mention, the fastest-talking and possibly loudest guy in the market. Who has time to softpedal his craft? Not Bill Liss. There’s a deadline lurking around every corner, and Liss will crush them all. Consider this another attempt at the Friday open thread. Do as Liss would do. Keep up the chatter. Make it learned and erudite, and keep the thread-count on the high side. This entry was posted in liss bill, WXIA on March 12, 2010 by live apt fire. Bill should be running the place over there…except that this class act is smart enough to know better. He’s a gem from another news era who runs rings around most of the other reporters in town half his age. I love Bill Liss stories. He’s the reason I watch 11alive more often than CBS ( Dagmar Midcap is the reason I watch CBS more often than Fox). Bill is a different breed but I’ve got a lot of respect for him. I think think the market as a whole appreciates what he continues to bring. I think there is an local internet meme in here somewhere. Something along the lines of the “Chuck Norris Facts”, we could have “Bill Liss Facts”. I’m not creative enough to get the ball rolling. I’ll leave that to the next commenter. That’s how it is today. As a reporter, in my case radio, you can’t do your story and put it on the air. I’m constantly thinking of ways to engage people through Twitter, Facebook, our website (www.pba.org) and other means. If you don’t adapt, you’re trapped. Good points, Charles. The penchant for timid, uncreative news directors/managers to over-micro manage and gate keep is forcing enterprising broadcast reporters to look elsewhere to express themselves. Thanks to fast evolving internet technology that can be had on the cheap one can do a quality end-run around the stuffy NPRish way, whatever in the hell that’s supposed to be. With perserverance and pluck the very talented such as Ira Glass found a way although it’s getting harder and harder to do on the traditional broadcast spectrum. Keep stretching yourself. You’ll get there. I’ve met Bill once and he truly is a class guy. He must be shaking his head at what he sees today. Does it bother anyone else that the only place the new store called The Dump is advertising on TV is on WXIA. And amazingly the spots started running after the news department ran a series of stories about the new store. Selling news for commercial buys? I’ve seen spots for The Dump on WAGA as well. Haven’t seen them run any news stories on the business. Yeah, I saw the Dump on WAGA as well. As for multitasking, there’s no way you can just do one thing and do it well. Twitter and Facebook, used properly, give us a way to interact with our audience as we’ve never been able to do. Of course, it adds thirty five percent to your workload, but hey, at least we still have a workload. To Those who commented on the Friday Open Thread: My great personal thanks and gratitude for watching what we do and for taking so much of your valuable time to write. I was enormously flattered by Friday’s Open Thread and equally flattered and humbled that you took the time to comment. Bill’s an icon on Atlanta television! He’s one of those reporters who really makes you think before you pick up the phone to call him with a story idea.